I will work my absolute hardest for you in your real estate transaction. No matter the size of the transaction, I strive to make all my clients feel as they are my only clients. 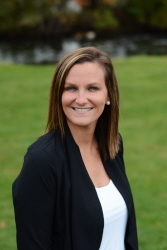 My office is located in the Plainwell / Otsego Area, but I travel all over Southwest Michigan to list and sell homes! If you think I look familiar, you are probably right! I have only had a few jobs in my life, but all of them have been service oriented in the Plainwell / Otsego area. Throughout college I managed a local tanning salon and waited tables at the London Grill Restaurant, allowing me to meet a lot of community members. More recently, I worked at Devon Title Agency, conducting many real estate and refinance closings. I have been married to my husband, Jesse, for 10 years. We have 2 kids, Grace and Lane who are enrolled in Otsego Public Schools. Jesse has been a wrestling and football coach for many years - GO BULLDOGS!- and works as a production supervisor for Green Bay Packaging. Grace and Lane keep us moving! Both kids are actively involved in school activities and sports year round.